The chapter aims at investigating the effects that the Communication of Corporate Social Responsibility and Sustainability exerts on consumers' perception considering the fast food industry in Italy. the McDonald's case study has been developed through managerial interviews and formal documents analysis in order to report on its strategies for CSR activities implementation and their communication in Italy. Moreover, through surveys conducted in Italy, the case study has been tested on a particular group of young consumers - Generation Z - less influenced by the past McDonald's activity in order to demonstrate how communications of sustainability are better believed and perceived, when a brand has a long tradition of misperceptions. In the current market scenario, and mostly under the uncertain economical conditions driving customers towards their purchases, affirming that the more a business is conducted according to certain commonly recognized set of “good” rules and behaviours the more customers will be attracted to it, it is a sort of understatement. 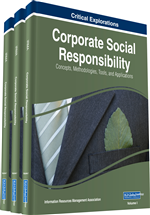 This is directly linked to what the business and academic communities define as Corporate Social Responsibility, or, Corporate Sustainability and Responsibility (Visser, 2013), taking as granted that every company that wants to succeed among its customers and, in general, be better perceived by its stakeholders, does have to base its whole business on sustainable practices, regarding the social, the environmental and the economical spheres at the same time. Consumers are greatly influenced by marketing communications that go beyond the points of sale, meaning that sustainable and responsible business models can sell more than any other marketing message, simply because they are in line with implicit practices and expectations of behaviours (De Pelsmacker et al., 2005). What said above is more valid when applied to certain business sectors, characterized by a lowered loyalty, increasing in criticisms and misperceptions by customers and stakeholders as well as doubts over the veracity of companies’ spread communication messages based on responsible and sustainable practices. Some of these sectors (such as the grocery and the banking) have previously been investigated by the authors (Candelo et al., 2015; 2016) as far as those issues are concerned. At this stage, the food industry is taken into consideration and, in particular, the retailing fast food industry, characterized by the so called “industry effect” that brings with it misperceptions and misjudgements among stakeholders that create difficulties in establishing, modifying and maintaining players’ corporate image and so retain and attract new customers. The case of McDonalds’ in Italy is investigated because of the intrinsic problems that the multinational has experienced over time connected to its rationalized and standardized production and sourcing methods, the quality of ingredients and overexploitation of lands and the evident drop in sales as consequence (Crawford et al., 2015). Moreover, the expansion in Italy since 1985 has been accompanied by several everyday challenges linked to the fact that Italy is widely acknowledged for the high quality of its food and the processing and sourcing of raw materials. As a result, McDonald’s strategy has started to be shaped and communicated based on a new set of rules. Understanding what these rules are, how they are communicated and how they, in fact, drive customers’ perceptions in a challenging food market such Italy is the aim of the present chapter. Many are the examples of virtuous fast food companies in different geographical markets (such as Chipotle or Panera Bread Company) that have strongly and proactively shifted their core business based on sustainability in an integrated approach (Freeman et al., 2010) that overcomes the traditional attitude of giving back to the society only once profit is reached and sees Corporate Social Responsibility or Sustainability implementation as a mere response to the mounting pressures of stakeholders (Torres et al., 2012; De Pedro and Gilabert, 2012; Vallaster et al., 2012; Kuepfer and Papula, 2010; Neal and Cochran, 2008; Freeman et al., 2002; 2004; Macleod, 2001; Mohr et al., 2001).